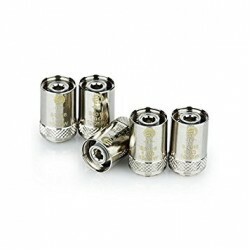 Widely regarded as one of the best mouth-to-lung (MTL) coils currently available, expect some great .. Aspire's Nautilus X coils are designed to provide a tasty, satisfying mouth-to-lung vape, and are ra.. The Aspire PockeX 0.6Ω Coils are designed to be used with Aspire's All in one kit; the PockeX.These ..
Contents1 x 5 Pack of Aspire Triton CoilsFeaturesAvailable in 0.3Ω, 0.4Ω or 1.8Ω0.3Ω (rated at 55-65.. In need of some replacement coils for your S-17 or S-22? Look no further.Supplied in packs of 5.Suit.. The BF series of coils from Joyetech are suitable for use in the AIO kit and the BF coil compatible .. The new Kanger SOCC (Single Organic Cotton Coil) is an updated version of the Single Coil heads.. The Kanger SSOCC coils are the updated version of the Kanger OCC coils and are manufactured with sta.. The new Kanger VOCC-T (Vertical Organic Cotton Coil, originally VOCC) is an updated version of the D..